For her appearance at a recent event, Swara picked a Global Desi jumpsuit to wear. By this time, you know we are suckers for some color. But, it really was hard to look past the overzealous use of bronzer; such a downer. Bit of a miss this. P.S: Click on images to enlarge. For two recent appearances of hers, Swara picked cropped denims to wear, styling one with a tank and blazer and the other, with a graphic tee. 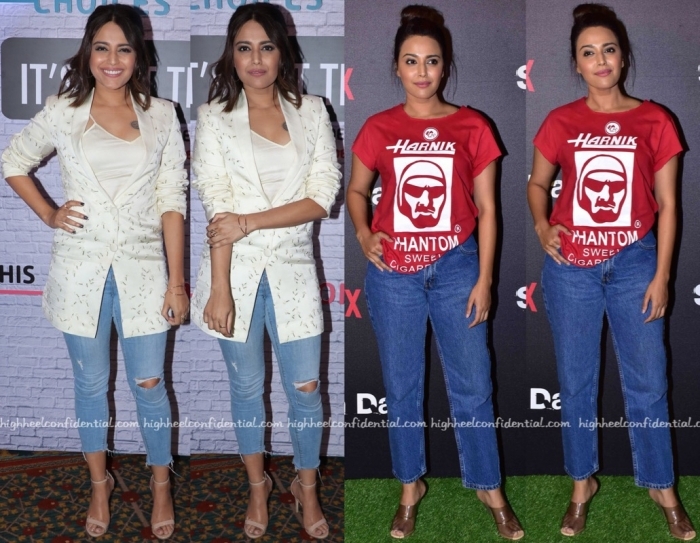 Wasn’t a fan of either look but the red graphic tee and denims combination was less problematic. There were clearly fit issues with the former that one couldn’t look past. P.S: Diana is wearing Jade.